Brenda and Wanda Henson set out to create a peaceful place for retreat and education in rural Mississippi. 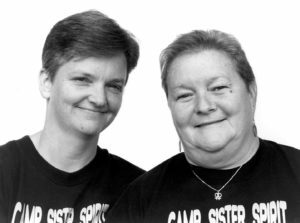 Instead, they were confronted with verbal, legal and physical harassment at their feminist education center, Camp Sister Spirit. They refused to abandon their vision of a safe place for women who faced abuse or discrimination. That vision evolved in Gulfport, Mississippi, where Brenda and Wanda met while serving as volunteer escorts at an abortion clinic. The attraction was immediate. Almost 19 years later, they remain together, sharing the same last name as a declaration of their commitment. A few years after they met, Brenda and Wanda opened the first feminist bookstore in Mississippi. The store expanded into a crisis center, providing services for women, children, and lesbian and gay families. As that work grew, they decided to move to the country and focus on outreach. The Hensons thought they had found the ideal place, a former pig farm in the tiny town of Ovett near Laurel, Mississippi. Their plan was to share the land with others who sought retreat in an environment that was free of violence, alcohol, illegal drugs and discrimination. Their arrival in the summer of 1993 was uneventful. Things changed a few months later after a copy of their newsletter was circulated among local residents. The Hensons planned to hold workshops on topics including sexism, racism and homophobia. Through the newsletter, it became clear that Brenda and Wanda were lesbians and that they intended to bring more lesbians into the conservative community. The response was quick: threatening mail and phone calls, gunfire near the property, a dead dog draped over a mail box, opposition statements made in local church pulpits and epithets toward women volunteers who were building a fence around the property. Soon the Southern Baptist Convention lent its support to a movement to buy the property and have the camp branded a public nuisance through a lawsuit. Some wondered why Brenda and Wanda didn’t just leave but the Hensons refused to respond with fear. Their plight attracted the support of others, including then-Attorney General Janet Reno, who sent federal investigators and mediators. Almost a decade later, the Hensons are still there. They won the public nuisance lawsuit and face no more litigation. They rarely encounter opposition. More than 5,000 visitors have spent time at the farm, which has been converted to a conference center with meeting rooms, a 40-person dormitory and rental cabins. In the past decade, they have expanded their work in Ovett. In addition to educational events and the retreat center, they serve the local community, providing clothing, school supplies, emergency food boxes and funds for GED exams. Brenda, who didn’t complete high school, obtained her GED before obtaining bachelor’s and master’s degrees and is continuing her education. Wanda is sharing her knowledge as a Family Nurse Practitioner by working four days near Natchez, Mississippi.